Sitting in the Press Box, hanging out with all the reporters and seeing how everything operates has been very interesting. I was given a Day Pass for the June 20th games. I was excited to have it but I was very conscious of the fact that it was only for the one day. I constantly wanted to cover it up when I was around all the other reporters. I desired one that had my picture on it and said “Media”. 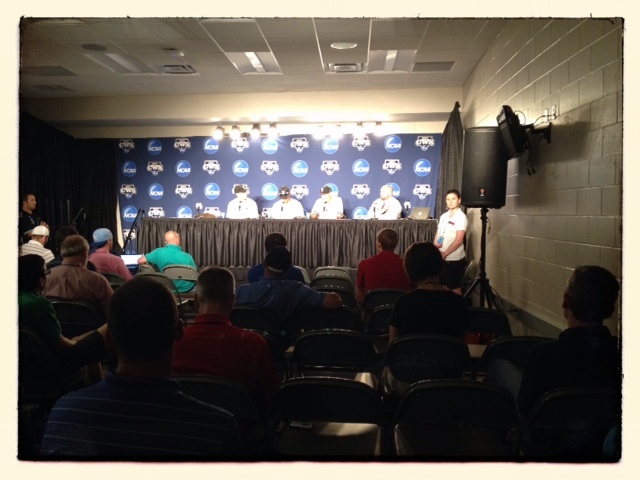 However, each individual that was issued a credential is given access to any NCAA championship game or related events. I was able to go onto the field, press conferences, interviews, or any other activity associated with the games played on June 20th. 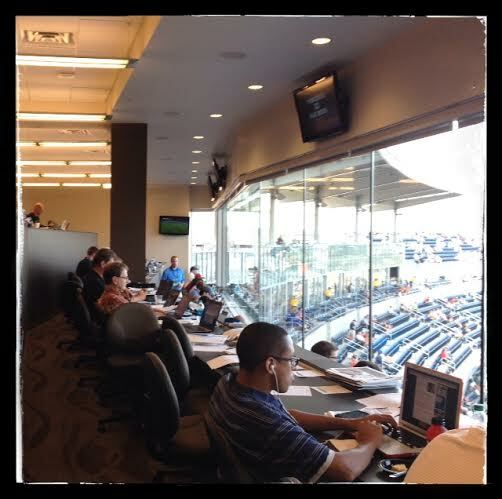 The Press Box is like a huge lounge where there are three rows of very long desks. Each row has room for 30 to 35 people. Reporters can set up their laptops, plug in and start writing. Initially, I was extremely aware at how out of place and new I was to this experience. I didn’t know what the rules were and where I should sit. I wasn’t assigned a seat since I was a Day Pass holder and had to find an open seat. I was told by J.D. Hamilton, the Assistant Director, I could take one that was at the end of the first row closest to home plate, adding – “There is no cheering in the Press Box.” I thought it was the best seat but I soon realized that it was not. I could see the entire playing field but didn’t have a view of the entire stadium. I also realized that there were TV’s above me that guys in the back rows could view and check out replays. I had to push my chair back and bend my head all the way back to view the one closest to me. I kept waiting for J.D. to come over to me to say that he made a mistake and that I couldn’t be in here. I set my computer up plugged everything in and headed for the main entrance of stadium. I had to meet Adam and Anthony from Austin to do a follow-up interview about my journey. I was looking forward to seeing them both. Their station was the first to do an interview about the Baseball Buddha journey. I was walking to the elevator keeping my head down and pretending to look at my phone. I was nervous for some reason. I had that feeling you have as a kid when you did something wrong and your parents were about to find out. I couldn’t shake it! Security checked my credential and let me through. I meet Adam and Anthony in front of the stadium. Anthony suggested we do the interview down on the field since I was credentialed. We walked up the steps into the stadium. I was carrying a clip board and pen. This was totally for effect, I had no intention of using it when I brought it along. I just wanted to make sure that people understood I was a serious journalist! (Do journalists use pen and paper anymore?) Adam and Anthony walked past the ushers. I, of course, thought we would be stopped so I pretended to write something on my pad of paper. We walked down on the field through the dugout. My senses were on HIGH alert. I seriously thought every one knew I didn’t belong there, but wasn’t saying anything. 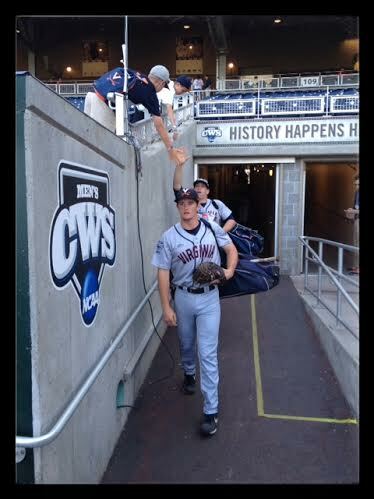 Anthony set up his camera on the field as Vanderbilt was taking batting practice. Adam was positioning me where he wanted me. By now some people were looking and wondering who I was. My thought pattern quickly switched to how I could get one of those baseballs Vandy was using, then quickly back to how old I was, then focused on Adam and the questions he was asking me. On the field between games! After the interview was over, Adam and Anthony had to do some other things. I decided to stand on the field and watch batting practice. Of course, admittedly, I was a little bit in awe of everything that was going on. I was impressed with everything. 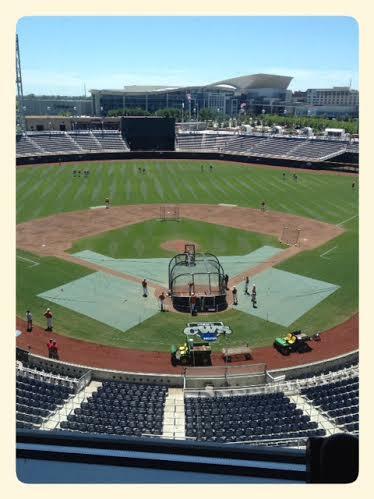 TD Ameritrade Park is only three years old. What I like most was there wasn’t sponsorship ads everywhere. Yes, TD Ameritrade was prominent on the sign but that was it. This place was about the College World Series and that was it! (My thoughts on all that will have to be another time.) After I scribbled a few fake notes on my pad a paper, I walked through the dugout and up the ramp which led to an area where some Vandy players were taking additional batting practice. The room had batting cages, along with the bathroom. The ramp ended on the concourse, an area utilized by all the personnel that work the games, along with the locker rooms and Press Conference area. I went back up to the Press Box and got ready for the game. I was really excited and I was trying to calm my brain down a little bit. Since I wanted to blog about the experience I didn’t know what to do when the game started. So, I decided to “Geek the Game” (kept score). That helps me focus and remember everything. I figured I would see what the “real” reporters did once the game started. One of the things I really liked was the microphones that were down on the field that were piped into the Press Box. You could hear the catcher, batter and the home plate umpire make his calls. I have to say that a few of the players like to swear a little bit! My mind started to calm down a little as the game progressed. I interacted with a few of the reporters. I am sure some wondered why I was keeping book since they provide all that information to you at the end of the game. I noticed that a lot of reporters were looking a lot of stuff up on the internet and discussing different aspects of the game. Most were trying to figure out their spin, what was important and what wasn’t. 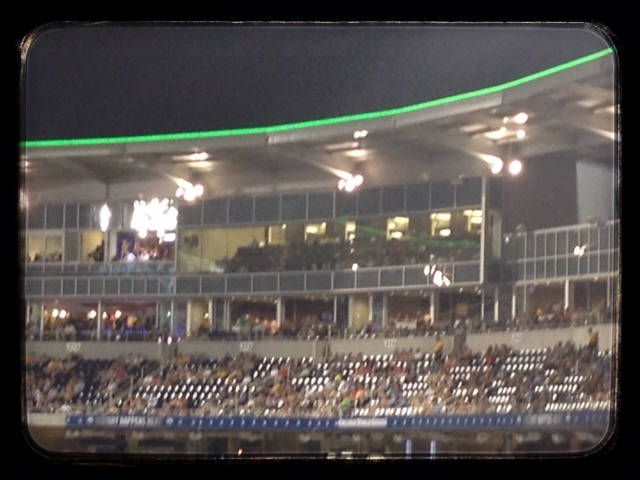 There is a lounge area behind the rows of seats that have snacks and drinks you can get while the game was going on. I, of course, snacked throughout the game. 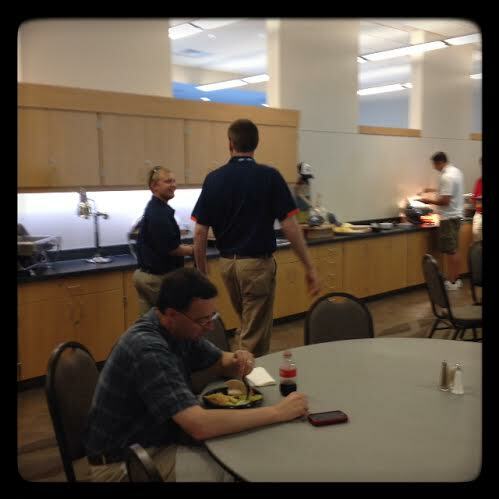 I tried to be discreet about it; however, I was very hungry since I didn’t eat very much before I got to the game. 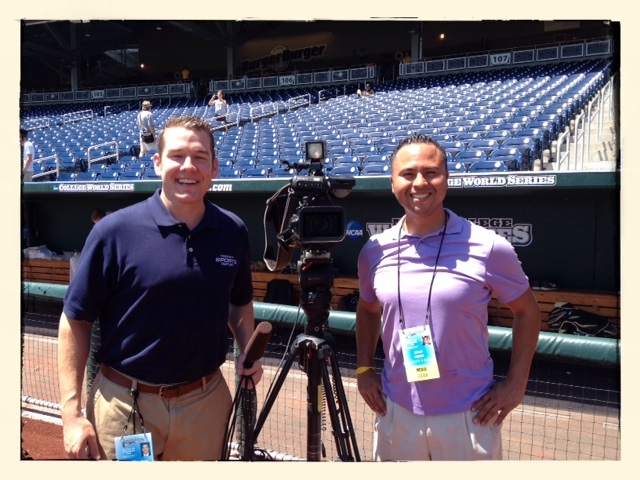 About the fifth inning I got a text from a local TV reporter who wanted to interview me. She asked if we could do it between games. I was feeling important since this would be my second interview of the day. I went to the post game press conference to see what that was like. I felt overwhelmed and wanted to ask a question of the players; but, I was too nervous and I decided not to. I excused my behavior as first time jitters. I then met the local reporter and the cameraman. We shot the interview down by the field, which was old hat now and I was confident we could be down there. I returned to the lounge area after the interview. Dinner was being served and, of course, I ate again. Adam and Anthony invited me to sit down with them. The group of people they were seated with were sports anchors for different stations around the country. Adam had me tell them my story. Thanks to Adam, again I was feeling like I belonged. I have a lot more to add regarding the rain delay and the game being suspended for the night, which turned out to be in my favor! 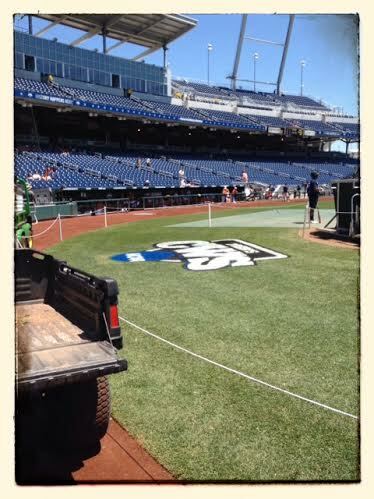 Check back tomorrow to finish reading my experience at the College World Series! No need to apologize for having a day pass John. Tommy Thompson uttered “Stick it to ‘um” to brag for votes as Governor. And he assented to Secretary of Health and Human Services under George W… Now that’s an oxymoron !